Calcium fluoride is the inorganic compound of the elements calcium and fluorine with the formula CaF2. It is a white insoluble solid. It occurs as the mineral fluorite (also called fluorspar), which is often deeply coloured owing to impurities. The compound crystallizes in a cubic motif called the fluorite structure. Unit cell of CaF2, known as fluorite structure, from two equivalent perspectives. 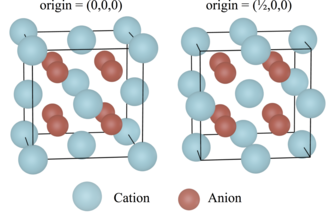 The second origin is often used when visualising point defects entered on the cation. Ca2+ centres are eight-coordinate, being centered in a "box" for eight F− centres. Each F− centre is coordinated to four Ca2+ centres. Although perfectly packed crystalline samples are colorless, the mineral is often deeply colored due to the presence of F-centers. The same crystal structure is found in numerous ionic compounds with formula AB2, such as CeO2, cubic ZrO2, UO2, ThO2, and PuO2. A related structure is the antifluorite structure, where the anions and cations are swapped, such as Be2C. Calcium fluoride is used to manufacture optical components such as windows and lenses, used in thermal imaging systems, spectroscopy, telescopes, and excimer lasers. It is transparent over a broad range from ultraviolet (UV) to infrared (IR) frequencies. Its low refractive index reduces the need for anti-reflection coatings. Its insolubility in water is convenient as well. Doped calcium fluoride, like natural fluorite, exhibits thermoluminescence and is used in thermoluminescent dosimeters. CaF2 is classified as "not dangerous", although reacting it with sulfuric acid produces toxic hydrofluoric acid. With regards to inhalation, the NIOSH-recommended concentration of fluorine-containing dusts is 2.5 mg/m3 in air. ^ "Fluorides (as F)". Immediately Dangerous to Life and Health Concentrations (IDLH). National Institute for Occupational Safety and Health (NIOSH). ^ Burr, P. A.; Cooper, M. W. D. (2017-09-15). "Importance of elastic finite-size effects: Neutral defects in ionic compounds". Physical Review B. 96 (9): 094107. arXiv:1709.02037. doi:10.1103/PhysRevB.96.094107. ^ a b Aigueperse, Jean; Mollard, Paul; Devilliers, Didier; Chemla, Marius; Faron, Robert; Romano, René; Cuer, Jean Pierre (2000). "Fluorine Compounds, Inorganic". doi:10.1002/14356007.a11_307. ^ Aigueperse, Jean; Mollard, Paul; Devilliers, Didier; Chemla, Marius; Faron, Robert; Romano, Renée; Cuer, Jean Pierre (2005), "Fluorine Compounds, Inorganic", Ullmann's Encyclopedia of Industrial Chemistry, Weinheim: Wiley-VCH, p. 307, doi:10.1002/14356007.a11_307.